Newswire > How can Masternode Cryptocurrencies Make Passive Income? The following article is introductory and aims to cover basic questions for those who are looking for masternode guide. Do not consider the information provided in this article as financial advice. You take a risk when investing, and this niche is not an exception. Please, do your own due diligence before investing in any specific masternode. I’m not your financial manager, fiduciary or investor. Read up and make your decision based on your life circumstances.What is a Masternode? Why Is Masternode a Good Alternative to PoW Mining and Trading? Taking into account current market conditions more and more crypto enthusiasts are gaining interest in being rewarded for holding tokens. Ain’s it’s beneficial than patiently waiting for the moon? Traditional Proof-of-Work (PoW) mining is not in the best shape. Therefore miners are not an exception as it’s getting harder to stay profitable. Plus, PoW mining isn’t friendly for mass adoption and requires huge network consumption. Another important fact is that you do not have to be a trading guru to start gaining additional income. These are just a few reasons why more buzz have been around the Proof-of-Stake (PoS) and Masternodes (MN). We have to admit that they are eye-catching nowadays, and considered as the future of cryptocurrency. Now you might be asking yourself “What is the Masternode?” Let’s get down to business! Well, in a nutshell, masternode is a server on a decentralized network. Some blockchain protocols provide for the creation of particular nodes that perform additional work on the verification of transactions and bring their owners regular profits. Such nodes are called masternodes. They regularly get rewards for completing such actions. Builds a curiosity? Move on! Why Do You Need to Launch a Masternode Now, Until it’s not Too Late? Masternode is a good option for the passive income, and there are several reasons why it might be the right time to start running a masternode or a few at once. First of all, masternodes are not so famous for now. However, this is likely to change soon. The same applies to rewards, which will decrease every year. Secondly, the coins are cheaper than in 2017/2018, which means that the entry threshold at the moment is much lower than before. It won’t cost you a fortune. Thirdly, at least some of these coins are expected to cost more whenever the upcoming bull run comes. Finally, it’s better to hodl and get rewards than merely hope for prices to go up. 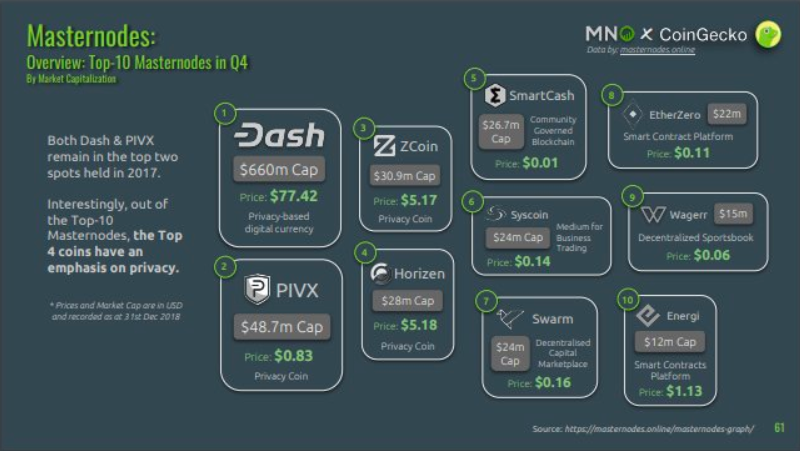 Although according to the CoinGecko 2018 report the numbers of both masternodes and masternode coins increased significantly during the past year, there is still a substantial drop in overall value. 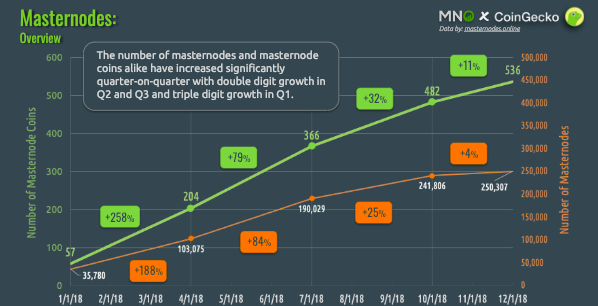 The total market cap for masternodes coins dropped from over $12 billion in January 2018 to just over $500 million by 2018’s end — a double-digit drop quarter-on-quarter. Nevertheless, it’s just the beginning. Remember, the early bird gets the worm! What is the Average Masternode ROI? Take in mind, that ROI is a relative term in the context of cryptocurrency space. We got used to the practice that ROI in crypto space is a bit another term, unlike the traditional markets where typically ROI measures per year and maybe 10%-20%. Although, ROI represents the result, do not pay much attention to it. It always depends on different factors and varies from time to time. How much would you have if you launched a masternode several months ago? These links below will help you to figure out. What are the Best Resources to Track the Masternodes ROI? 1. 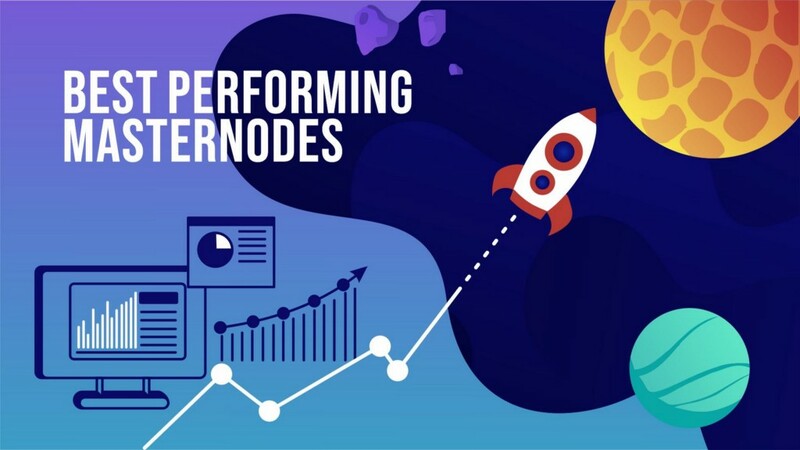 Masternodes.Pro tracks all the masternode coins available in the market and provides statistics, information, price, annual return on investment, and more information about each currency. 2. Masternodes.Online is another website that displays the essential information about crypto masternodes. 3. Masternode.Buzz shows you the stats per week, month, and year to date. Easy to track recent changes. What’s the Secret Sauce? How to Pick Up the High ROI Masternode? You may have your own opinion on which coin is the best for investing in masternode, which is fine. I will summarize a few criteria I would pay attention before investing funds in launching the masternode. First of all, it is crucial to assess the project’s lifetime and the technological aspect. Make sure to ask yourself: Is there a solid roadmap? What is going on with the activity on the Github? How undervalued the project is and what problem does it aims to solve? How strong is the team? Pay attention to the liquidity of the coin — check out where you can trade the token, and what is the daily volume. Listing on Binance is not obligated, but it is desirable that you can trade it on several exchanges, ideally not on the no-name with minimal volumes. An exception can be made for super new coins, which did not manage to create a buzz around themselves, attract the attention, and gather the community, but technologically they are pretty perspective. Although the funds invested in the launch of the masternode are under your complete control, the masternode set up process itself requires the investment of specific technical efforts and time. All these factors give us a clear understanding that the masternode launch isn’t a one-click deal. Do not confuse investment in masternode with trading — follow the long-term vision or middle-term (at least half a year). A minimum number of coins required to launch masternode. This is an individual parameter for each project. Plus, depends on your financial conditions and the amount you are ready to risk. Nevertheless, I would like to note that every coin has a different minimum input threshold to launch the masternode. At the same time, the maximum level is usually not limited. Finally, ROI. Calculate the percentage ratio of the expected annual profit to the number of coins that are technically necessary for launching the master codes. It is optimal to consider the ROI in the coins you are going to receive. Thus, the ROI is determined only by the technical parameters of the coin and active masternodes in the network itself. These are projects which proved the reliability. Some of them can make you a fortune. Please, do your own research. A revolutionary digital money system for an instant, private payments online or in-store using our secure open-source platform hosted by thousands of users around the world. The powerful multi-purpose platform that puts your business on the blockchain. Swarm is the Future of Investing. The team is building decentralized compliant infrastructure for tokenizing, ownership and governance of assets. Private — Instant — Verified — Transaction. Fast, Decentralized, Anonymous, Proof of Stake Cryptocurrency. Energi aims to become a dominant cryptocurrency platform. SmartCash is a project born out of the desire to create a viable, fast, merchant oriented, user-friendly and community-driven cryptocurrency with a decentralized governance system. How can Masternode Cryptocurrencies Make Passive Income? was originally published in Good Audience on Medium, where people are continuing the conversation by highlighting and responding to this story.